Leftover chicken bones or carcass roughly equivalent to one small or medium sized chicken OR one whole chicken approximately 4 lbs. (save the bones and store in freezer for more stock later). Note: If you are missing any of these herbs I wouldn’t let that stop you from making it anyway. After removing all edible meat from the chicken put the bones in the oven at 350 degrees for 20 minutes, checking at 10 minutes and turning over to fully brown. If you are using a whole chicken skip this step and go to step #2. Add the bones (or whole chicken), onion, celery, carrot and spices on top of the bones and fill the crock pot almost to the top with tap water (leaving about 1/2” at the top). Put in ¼ cup of Bragg’s apple cider vinegar to crock pot and let sit for 1 hour. After the stock is done cooking turn off the heat and, using a soup ladle, pass the stock through a fine mesh strainer to remove all herbs/bones/etc. Either refrigerate or freeze the stock for future use. I usually freeze some in both 1 and 2-cup portions, and I also sometimes freeze stock in ice cube trays just in case I just “need a little” for making a sauce. This stock is great in soups or all by itself as a soothing drink. Enjoy! Ask the butcher to cut in half the large tubular bones, so you can get the bone marrow out of them after cooking. You can make fish stock the same way using a whole fish or fish fins, bones and heads. After cooking take the bones and meat out and sieve the stock to remove small bones and peppercorns. Strip off all the soft tissues from the bones as best as you can to later add to soups. Extract the bone marrow out of large tubular bones while they are still warm: to do that bang the bone on a thick wooden chopping board. The gelatinous soft tissues around the bones and the bone marrow provide some of the best healing remedies for the gut lining and the immune system; best to consume with every meal. Take off all the soft tissues from fish bones and heads and reserve for adding to soups later. 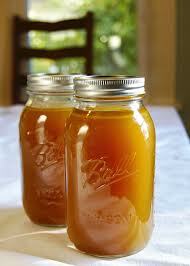 The meat or fish stock will keep well in the fridge for at least 7 days or it can be frozen.